For part two, we’ll be covering both defense positions. Let’s start with an absolute MUST… turn OFF auto back-skate. 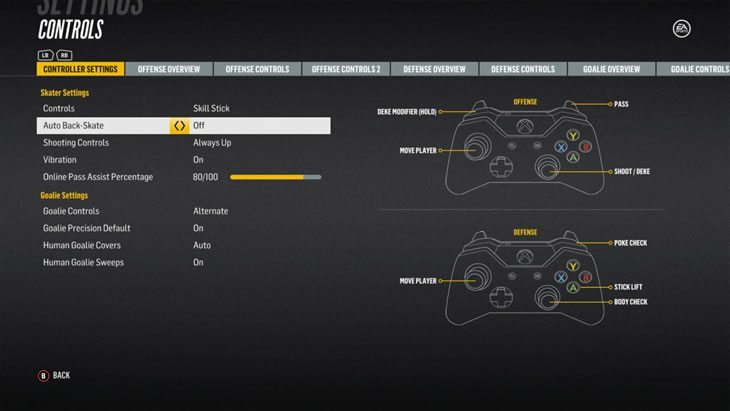 Auto back-skate is a feature in EA Sports NHL that is turned on by default and will automatically make your player start skating backward when the GAME thinks you should be. It’s just a game so it might not always know what is best. At the highest level of competition, you will want full control of your player – or at least as much control as EA will allow you to have. The key to two defense partners success is communication and balance. If one is on the left side, the other should be on the right. If one is in the corner or behind the net, the other one should be in front of the net. If the left defender is playing the person with the puck, and they go behind the net and to the right side, the right side defender should move over to the left side OR take over covering the person with the puck. *Weak-side defender refers to the side where the puck is NOT. For example, if the puck is in your zone in the right corner then the Right Defenseman would be on the strong-side and Left Defenseman on the weak-side. The most important things to remember when trying to break out of your zone is to make a hard and accurate first pass, support your defensive partner, and stay in good defensive position if the breakout fails. Taking your time and not forcing passes is crucial when breaking out of your zone as you want to give your forwards a clean breakout pass and not a suicide pass resulting in a turnover. Going D-To-D with passes or carrying/dumping the puck into the offensive zone is recommended when your forwards are covered. Resetting the breakout will often be the best option to avoid forcing a dangerous pass. Don’t be afraid to call your forwards back for some support. Now that you’re in the neutral zone, your job is to make sure that if the puck is turned over, you don’t give up an odd-man chance or breakaway. Pass the puck to your forwards and let them take it in. If you happen to get the puck in the neutral zone and there is nobody else open, just dump the puck into the offensive zone for your forwards to chase. A dump and chase strategy isn’t glamorous by any means, but if you’re under some pressure, then it can be a great way to avoid a bad turnover. You never want to turn the puck over, but if you do then it’s much better turned over in the offensive zone than in the Defensive or Neutral zones. DO NOT go for the big hit every time your opponent is trying to enter your zone. Doing so will often result in a 2 on 1 if they get by you and you’ll have left your defense partner out to dry. DO NOT try to be a hero. I know that is bit more arbitrary than the last tip, but it can be summed up by saying “don’t take unnecessary offensive risks.” Make the safe play by passing to an open teammate or dumping in the puck instead of trying to dangle through defenders. If you do jump into the play offensively, then make sure your forwards are aware, and one of them covers for you. We have two top level EASHL players here to demonstrate the above tips and talk about each position in-depth. Do you play forward? Check out King Blings Forward EASHL Tips. If you liked the videos then go give King Bling’s YouTube channel a subscribe! Need help choosing an EASHL player class? Head over to our Ultimate NHL 18 EASHL Player Class Guide.